When the opportunity to play and review the latest incarnation in the International Cricket Captain presented itself to me, it was one I was eager to snap up. I have enjoyed previous versions of the game and got plenty of hours trying to lead various counties to glory. So what would the 2009 version offer? When you have a succesful formula, the big challenge is to ensure that you don’t confuse long-standing fans of the series with drastic changes but also that you offer enough to make people want to buy the new version of the game. A long-standing criticism of the old versions was that they were simply reissues of the 2002 engine with updated players and statistics. This was addressed to some extent with the release of ICC III where 3D graphics were introduced. When you first load the game up, you certainly do get a familiar feeling, with the same basic layout employed as in previous versions of the game. There certainly doesn’t seem to be a problem with regards to drastic changes, but will there be enough to attract critics who feel the series hasn’t moved on enough? As with the previous versions, there are plenty of different options for the different games that you can play. You can choose the full game, where you select an English county and attempt to lead them to success and ultimately a top international job beckons. You can choose to simultaneously run a county and international side, or you can simply select an international side to start with. 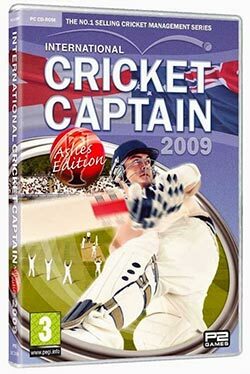 As it is an Ashes year there is an Ashes series option, you can set up a customised series of your own, and finally there is the Twenty20 World Cup. The fact that there are so many different game options is a big plus. 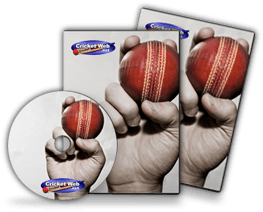 Other similar games, both in cricket and other sports, only really focus on playing a long-running game, the shorter options here cater for a user who wants to play a quick game without getting too involved. When playing the full game, the only domestic sides available are the English ones. This, I believe, is a weakness of the series, as including at least some other domestic competitions would really add variety and long-term playability to the game. It would also strengthen the international side of the game, with a larger database involved. At the very least including the Australian competitions would be of huge interest to devoted cricket fans, and a large proportion of this game’s players are likely to be just that. This being said, the gameplay in the full game is still very good. Squads are accurate and well-researched, although it would be nice to get more information on players. As with the older versions, we get their averages and other statistics, and a few notes about their preferred styles of play. This makes selecting youngsters very difficult as you don’t have a lot to go off, and adds an air of randomness to trying to build a team in the long-term. 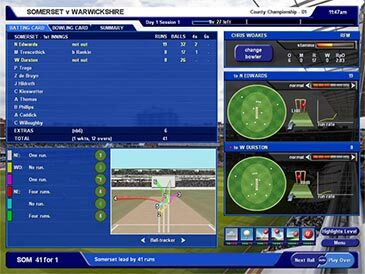 The match screen has a lot of information on it, including a usefull ball-tracker which allows you to see where the bowlers have landed each ball; in older versions you had to watch ball-by-ball highlights to see why the bowler was or wasn’t doing well, so this is very useful. It shows you that even though Saj Mahmood just bowled a maiden, he sprayed a few of the balls into dodgy areas and was lucky not to get hit out of town, and so you bring Glen Chapple on instead. A good thing about ICC is that it has always allowed you to be as involved or passive as you wish during a match. The options to play either ball-by-ball or over-by-over are there, there is also an ‘auto’ option. Pressing this has the game running automatically until a highlight comes on, or until you make some sort of change. 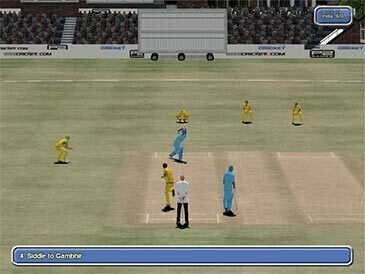 It is an option that doesn’t really work when you are bowling, but is highly useful when batting, especially if you have highlights switched off. Previous games have suffered from a lack of realism and these seems to be an improvement of the 2009 version. In old games, you could stick anyone who bowled spin on if the pitch was taking turn and you were guaranteed a hatful, that certainly doesn’t appear to be the case here. Part-time spinners get taken apart if you leave them on for more than a couple of overs, just as they generally do in real life. Another plus point for realism is that I somehow managed to lead England to defeat against the Netherlands in the Twenty20 World Cup! The Twenty20 option suffers slightly, though, because you can’t lead any of the associates and the squads are already picked when you start, which means you are stuck with the thoughts of the selectors of the nation you choose. This, in a way, defies the point of a game like this. The international options are generally quite good. There is a wealth of players to choose from if you choose whichever nation you choose, in spite of the lack of domestic options outside of England. The recommended squads are generally quite up to date as well, with inclusions such as Hughes for Australia and Onions for England. This hasn’t always been the case, on the 2005 version Mark Butcher and Graeme Thorpe were still preferred to Kevin Pietersen for England. There are a few minor little details which could be improved, such as the fact that Langer is available for selection for Australia, but they don’t really detract from the gameplay. Highlights play a big part in the game if you wish for them to, and they are improved on previous versions, with a little bit more variation in the deliveries and outcomes. We get hawkeye for LBWs, although the umpires always get the decisions right which you could argue detracts from the realism of the game; being screwed over now and again by an incorrect dismissal really adds to the experience in this sort of game I find. The players aren’t really individualised on highlights aside from hair and skin colour but that doesn’t really matter as we don’t get close-ups of them anyway. Visually, the highlights aren’t perfect but they have gone in the right direction, and you don’t have to use them if you don’t wish to. Unfortunately, though, the highlights are significantly let down by commentary. The exact same audio is used as on the older versions of the game, and once you have played a match you have heard everything that is going to be said. If the commentary was better I would want to watch the highlights more. There are little things which add to the experience, such as the fact that the game now remembers your previous highlight settings and doesn’t reset your Test team when you play a series at home. Little factors like these became really irritating over time previously so it is great to see them addressed. In general, this game is a step in the right direction. There are enough different gameplay options to keep you interested, but this could be significantly improved by adding more domestic competitions to it. The IPL and Sheffield Shields are musts for the future versions if the game is to evolve. If you are a cricket nut and have enjoyed the previous games then you will also enjoy this one. However if you have steered clear of updates over the last few years because of a lack of significant changes then you might not find much to get your attention in this one. The game is more attractive aesthetically than previous versions, and it remains very playable, but there aren’t huge changes. If you love the series then you will love this, but with more widespread changes expected for next year’s version, that may be the one which attracts users who haven’t bothered to upgrade in a while.